Introducing the Revolutionary New Curved Baritone Neck - the fist and only in the world to create an ergonomic solution to baritone saxophone. The elegant curve raises the horn three inches higher than traditional necks, dramatically improving the musician's posture. This reduces and prevents pain, nerve damage, and muscle strain in both the neck and hands. 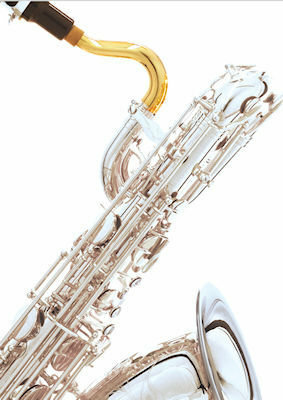 Custom Finish for Saxophone Neck Pipe: Silver, Black Nickel, or Other. Does not include price for custom octave key finish. 2017 was a signature year for our newly unveiled curved baritone necks. The improved acoustically and structurally-stronger design has gained accolades from pro musicians. Here is what Terry Landry, a highly notable and internationally coveted woodwind pro and a baritone specialist, had to say about the new Oleg Curved Baritone Neck. “The new neck makes it even easier & more seamless to switch between alto, tenor, and bari. My bari feels more like my other horns than ever before. There is zero acclimation period now, when switching. Most of what I've been playing on bari, since I got the new neck, has been live work, in loud bands. I'm better able than ever before to project & compete with the volume of guitars, etc., yet I have greater control over nuances. Thus, even in sub-optimal conditions, I'm never working so hard that I blow past the resonance. I can't adequately articulate the monumental importance of this. It's a true game changer. Similarly, gone are the "misfires" -- previously a fact of life for bari players-- where I go to play a loud, low, staccato note, such as low D, and nothing comes out. These have always been especially problematic in studio work, where pristine accuracy is tantamount. I used to be forced to "hyper-focus" my air stream, making tiny adjustments for every note-- but no more. I just play.